It’s that time of year where we raise a glass to send off an awesome Summer filled with lots of sunshine, sand and seashells to welcoming Fall with flip-flops, pumpkin spice lattes and 70 degree temps! It doesn’t get any better than that! OR does it? I’m happy to share the good news! On Saturday, September 24th, a new establishment will be opening their doors to you and your family, bringing a wide variety of fun and excitement! If you’re looking for something new and invigorating that involves VINO, Wine & Design has all the ingredients to make you experience all the feels! You’ll get the opportunity to meet new people, explore your artistic side and share special moments with the ones you love! 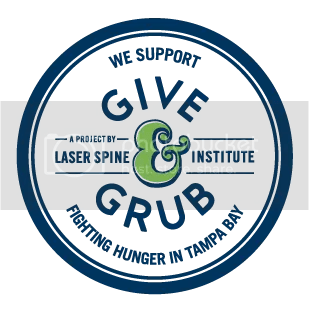 In addition to the kick-off event on Saturday, a portion of the proceeds collected that day ONLY, will go towards the non-profit organization, Blue Turtle Society (BTS). Not only are you taking care of yourself, but you’re helping take care of our environment and all the adorable species along the way. So have you ever seen a grand opening party last more than 24 hours? Nope, me neither. I’m happy to share that this party will continue through Wednesday, September 28th! Check out the detailed schedule of events to follow Saturday’s extravaganza! Come on out and party with us! If you think the fun stops after the 28th, I’ve got awesome news for you! Check out the different opportunities that you get to delve into anytime you want! It’s certainly a win/win!! PLEASE NOTE: A free future class ($35.00 value) will be offered to the first 20 people who sign up right now! Be sure to claim your spot ASAP!! Doors will open on Saturday, September 24th at 6:00pm with lots of laughter, a blank canvas and new paint brushes ready for your imagination! 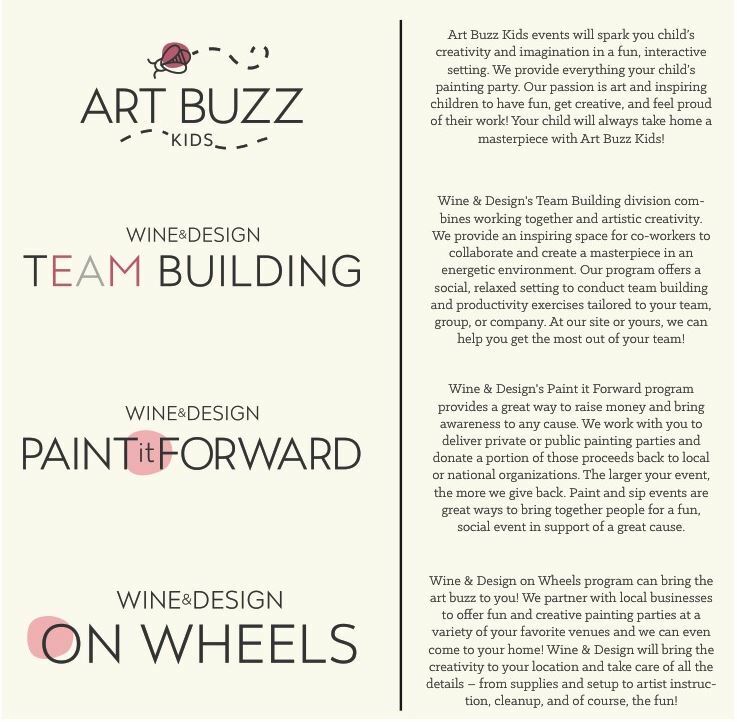 For more information, be sure to follow Wine & Design on social media! Would you like to WIN a FREE class to Wine & Design? Leave me a comment below telling me WHY you’d love to have this awesome opportunity to exercise your art skills, and I’ll choose TWO random comments on September 25th (using Random.org) and announce the winners here on the blog and on social media! Stay tuned. Follow Wine & Design on Twitter. Like Wine & Design on Facebook. a party that lasts like that – WOW how exciting that is! I love going to these types of painting places. It’s so much fun and you actually leave with something you created (good or bad). I love free classes. Sounds like it will be all worth it to attend and then to support the business. Happy fall! I’m not ready for the colder weather but, it is here. I am embracing it. Sounds like a great opening party! Too bad I live so far away! Wow this sounds so cool! What a fun giveaway! Wow you have a lot of great events here. I really like that the first one donates part of the proceeds to the non-profit organization, Blue Turtle Society. Thanks for sharing! These seem like they will be a lot of fun! What an amazing event and giveaway. 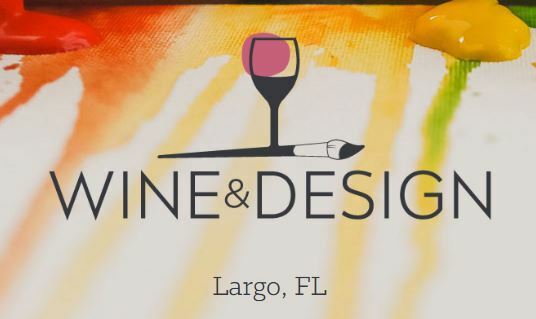 Love wine and design and I live in Florida match made in heaven. I will apply for the giveaway =) wish me luck . It sounds like a whole week packed with fun. I love that they have a day for the kids as well. 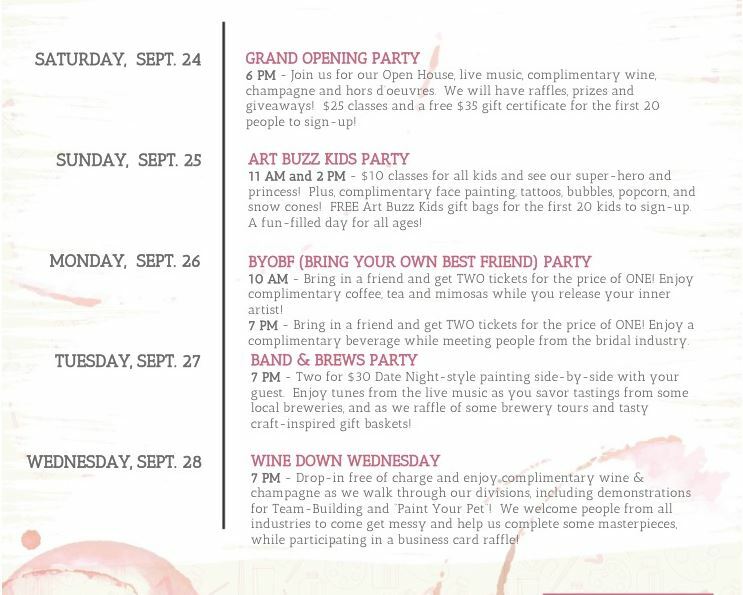 This looks like an awesome grand opening party! I’m so glad they have thought about kids too and offer them different activities. This sounds like a fun event. Too bad we won’t be in the area. I have been wanting to try something like this! This sounds like a fantastic place to go if you are ever in the area. I live in NY and do not plan on going to Florida anytime soon or I would surely try to go to Largo and experience this for myself. Sounds like a wonderful event with lots of fun and it is good to see they have a day allocated for kids as well. The Art Buzz Kids party could be a hit among kids for sure! We have several of these places here in the Kansas City area but I’ve never gone! I think it looks really fun, though! What a fun event! And such a fun giveaway too 🙂 I love painting places like this also! They can be so fun, and they’re so easy to find now. Love this, thank you for sharing! 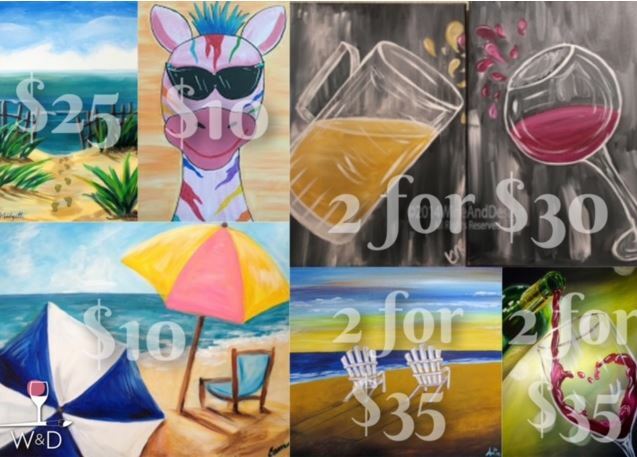 I’ve always wanted to get a group of friends together and go to one of the wine and canvas painting classes. I’m not much of an artist, but painting with friends would be so much fun. Plus, I love the idea of being able to take something home from your night out.